At this point in time, starting Michael Vick every single week is something that must be done, but even more so this week as Vick will lead in the Philadelphia Eagles against the lowly Minnesota Vikings. The Vikings may have had one of the best defenses in the league last season, but this year they haven’t been the same team and will almost certainly get torched by the NFL MVP candidate quarterback. The Oakland Raiders may be the first team in NFL history to go undefeated in their divsion (AFC West) and not make the playoffs, but they still have a shot at making the postseason if they can get the best of the Indianapolis Colts and the Kansas City Chiefs in the next two weeks. 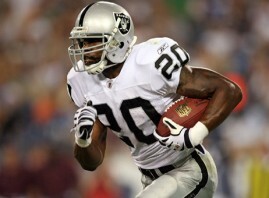 With the Colts having one of the worst run defenses in the league, the Raiders have a chance get a lot of yards and rushing touchdowns out of up and coming running back Darren McFadden. The Houston Texans are basically on the outside looking in on the playoffs once again this season as they have failed to play consistently well throughout this season, but in Week 16 they might have perhaps their best day offensively as they will be going up against arguably one of the worst teams in the league in the Denver Broncos. With the Broncos secondary playing just awful up to this point in the NFL regular season, Matt Schaub and Andre Johnson will most likely have a field day in the passing game which bodes well for fantasy owners. The Dallas Cowboys season is over as they have already been knocked out of playoff contention, but despite playing just for pride, the Cowboys offense will look to have a big day offensively in Week 16. With the Arizona Cardinals being their next opponent, the Dallas Cowboys will most likely light up the scoreboard with Jason Witten being one of Jon Kitna’s favorite targets in the endzone. The New York Jets are coming off of arguably one of the most impressive wins of the season as they were able to get the best of the playoff bound Pittsburgh Steelers. In Week 16, the New York Jets will have their work cut out for them once again against another playoff bound team in the Chicago Bears. Even though Mark Sanchez and company might struggle to put points on the board, the Jets defense should do pretty well against the Bears offense.